I've been adopted by my foster family! Hooray! Hi there! Nice to meet you. I'm Northstar. How are you? A few things about me: I become quite trusting if you take some time to let me come to you. I'll bring you lots of laughs and trouble if you bring me all the pets. If Mexican is on the menu for your night, I won't mind if you throw a bit of cilantro my way. I'm very curious and never nibble, besides, I like eating my pellets better anyway. I'll sit on the couch all night if you tire me out and pet my big ears. I'm still holding out on showing my first big binky, but maybe it's for you! 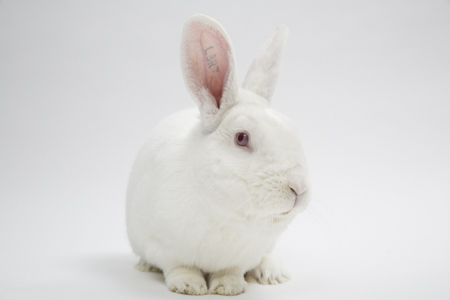 Ed note: Northstar is one of seven rabbits rescued from a backyard "meat rabbit" breeder in Lincoln, California. Northstar and his six brothers and sisters (including Vail and Alpine were left behind when the breeder moved and abandoned the rabbits with no food or water. Thanks to Margo DeMello of House Rabbit Society, as well as Harvest Home and Animal Place for helping SaveABunny with this rescue.